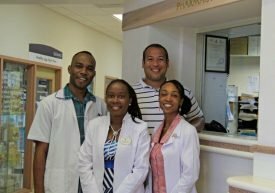 In June 2013, four Pharmacists from the Cayman Pharmacy Group received their Caribbean Certified Diabetes Educator (CCDE) Certificates from the programme offered by the University of the West Indies. Daemione White, Simone Davis, Todd Jefferson and Shashorna Campbell earned their certifications after attending a 12 hour seminar presented by CCDE trainer Nurse Andrea Hunt as well as the successful completion of 250 hours of diabetes education with clients who have pre-diabetes, Type I or Type II diabetes, and gestational diabetes. Each of the four pharmacists also successfully completed the CCDE exam. These qualifications are similar to the American and Canadian Diabetes Education Certification qualifications. The Diabetes Education Centre at Professional Pharmacy in CTMH offers five hours of complimentary diabetes education to all patients who patronize any of the Cayman Pharmacy Group’s three locations. The service will expand to be offered at West Bay Pharmacy & Gifts this autumn. “As joint pharmacists and CCDEs, we have the additional expertise to review our client’s medication care plan. We can educate our clients on the purpose, side-effects and how to administer their medications to receive the most benefit,” Davis emphasized. Cayman Pharmacy Group has three Pharmacies: Professional Pharmacy Services at CTMH, West Bay Pharmacy and Gifts at Centennial Towers, and Savannah Pharmacy and Gifts at Countryside Shopping Village. Mr. David Pellow is the General Manager of the Cayman Pharmacy Group, and is the Chief Pharmacist at Professional Pharmacy Services Ltd, located at CTMH. For information on Cayman Pharmacy Group or the Diabetes Education Centre, visit www.caymanpharmacy.com. Photo Caption: (L-R) Daemione White, Simone Davis, Todd Jefferson and Shashorna Campbell recently earned Certificates in Diabetes Education from the University of the West Indies.